We can design a patio that makes your small backyard seem like an expansive hideaway. 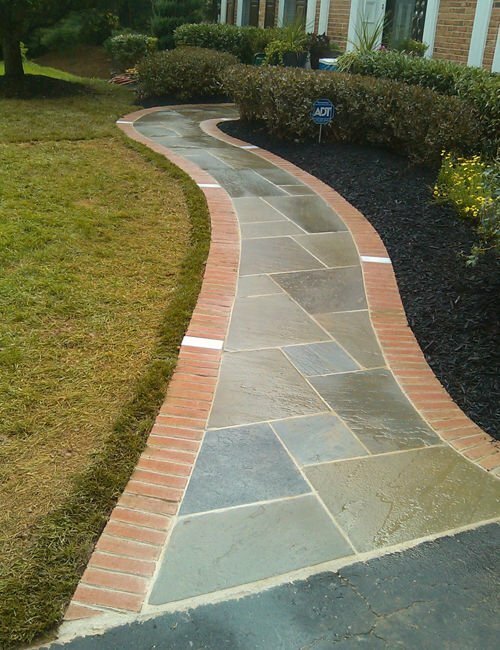 Our paver walkways will turn that muddy track on the side of your house into a path you love walking down. We can change your driveway from cracking concrete that clashes with your home to a natural extension of your house’s exterior. Our decades of landscape expertise means you don’t have to sweat the problematic details. You can give us the broad strokes. We’ll figure out how to make it work. We know how to mitigate drainage issues, plant no-maintenance gardens and keep costs low. Johnson’s is your full-service landscape solution with no hassles. 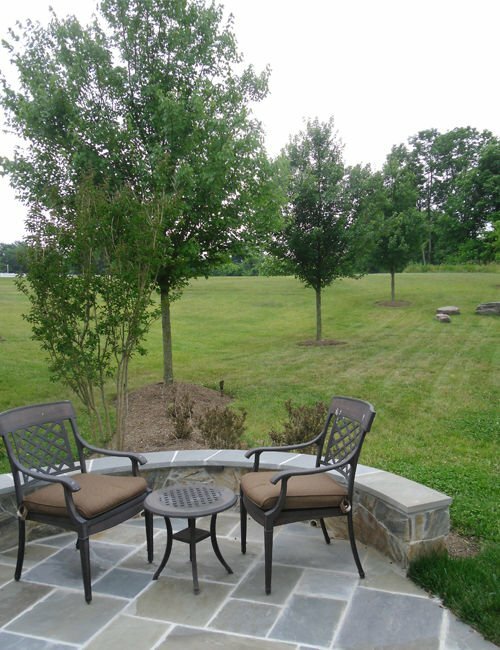 Our masons and landscape designers know you have a unique vision for your outdoor space. We want to make it come true. Our five-step process ensures that you get exactly the patio, walkway or driveway you want. The unique system creates a collaborative environment where your voice is heard. First, we get acquainted over the phone. During the call, we get a feel for the scope of work, like how much of your yard the patio would take up or how long a flagstone walkway you would need. Next comes a free site visit from a member of our design team. Our expert landscape designer will dig deep into your ideas and offer suggestions to make them a reality. After the site visit, your designer builds a proposal with a scope of work and estimates on materials and labor. 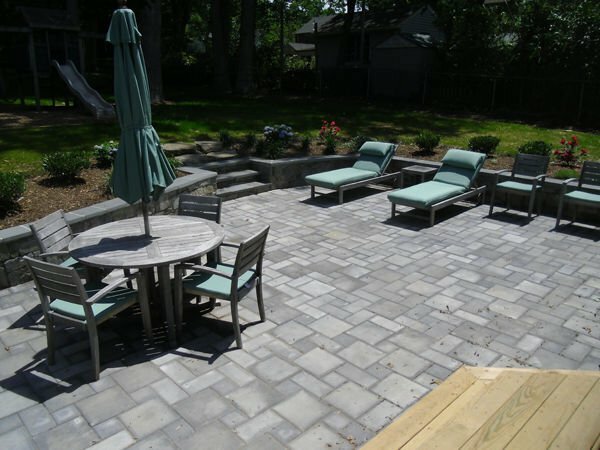 You give your feedback, and the landscape designer drafts detailed drawings of your new patio or driveway or stone wall. 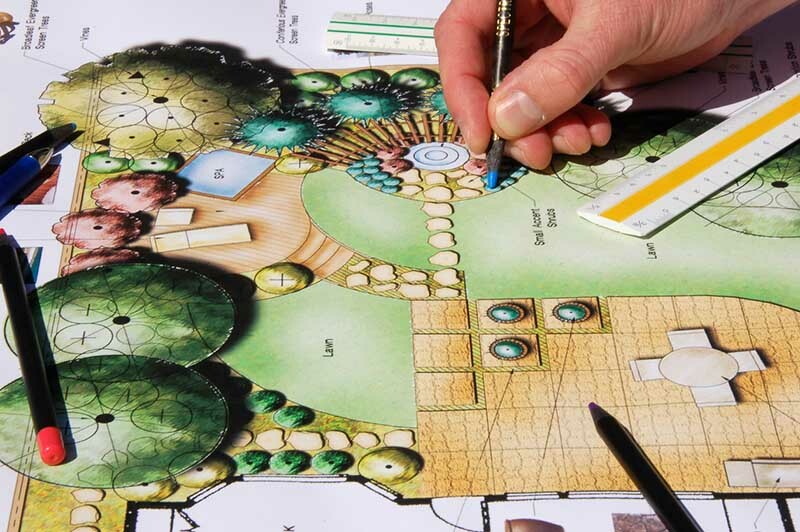 This personalized landscape design will lay out exactly what materials and labor will be needed, and it forms the basis for the contract. Once we finalize the contract, work can begin. All that preparation pays off as our workers know exactly what you want thanks to our long back-and-forth process. You’ll see the project come together just as you envisioned it. After the installation, we’ll review the project and ensure you’re delighted with the work. 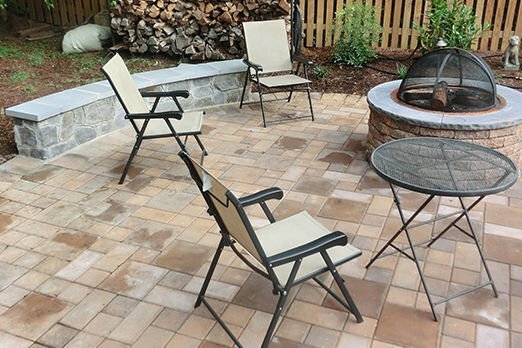 Then our experts will recommend a maintenance program to keep your new patio looking its best. A patio gives you outdoor living space all your own. Relax after work or entertain a crowd of friends. Build a gardener’s oasis or a grill master’s workshop — or both. We can work together to design one that suits precisely your needs. Building a patio is about freedom. You’re freeing yourself not just from the walls and ceilings of your home, but also from restrictive design conventions. If you can envision a patio, we can make it. Do you love barbecuing? Imagine having an expansive slate patio for entertaining with space for all your friends and family and room to cook a huge, delicious meal and serve everyone. Do you want a space to relax after work? We can create a patio built around a lush batch of flowers with a water feature and a hammock. Want an intimate setting to share with a special someone? Think of an enclosed patio with a swing, soft lighting and a table for two. We also build many patio-like areas for specific purposes. We can hide an A/C unit or give you a nice, clean parking spot for your trash cans for instance. If you don’t have much room, our innovative landscape designers know how to get the most out of small spaces. We’ve fit fireplaces, built-in kitchens, and seating areas for huge parties. 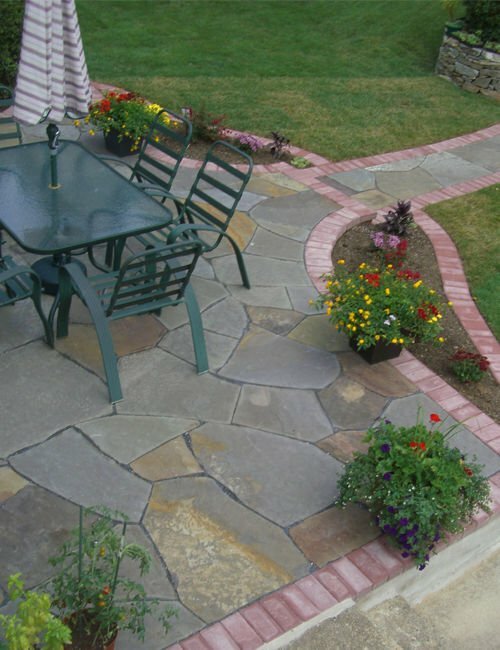 The versatility of a patio means you can combine it with your other landscaping elements, like a stone planter garden as a wall or a matching walkway to your trash storage area. We maximize your useable space. 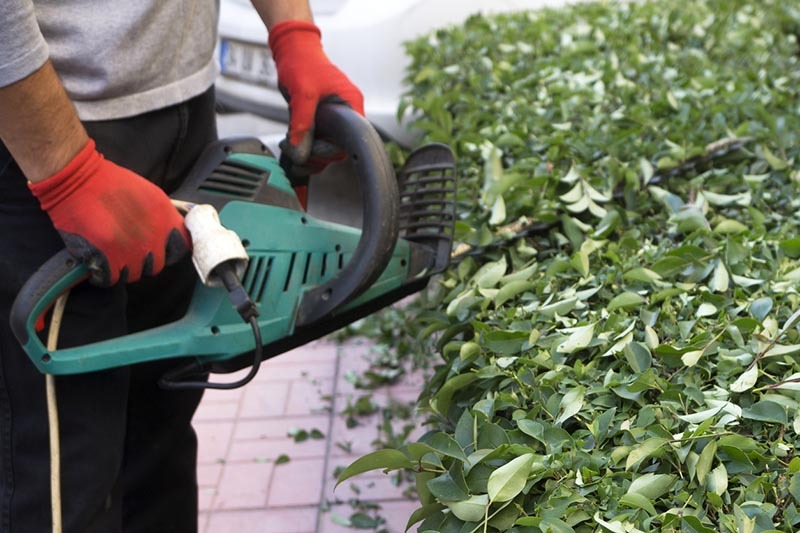 Whatever your patio landscaping need, our flexible staff knows how to make it happen. When you’re running gas and electric lines to new outdoor fixtures, you know you want a team with tons of experience. We’ve installed hundreds of outdoor kitchen appliances and grills, so you won’t have to worry about meeting code. Walkways are often overlooked in landscape design. At Johnson’s, we know the critical role they play in increasing your useable space and boosting your curb appeal. Walkways transition from your artificial space to your natural space. They connect your landscaping features into a cohesive whole. A walkway extends the useable space on your property, so you get the most out of your money. They give you easy access to your gardens, gazebos, ponds and other yard features. And they let you enjoy your yard even after inclement weather. No more sloshing through mud. At Johnson’s our versatile masons can build with whatever material best suits your needs. 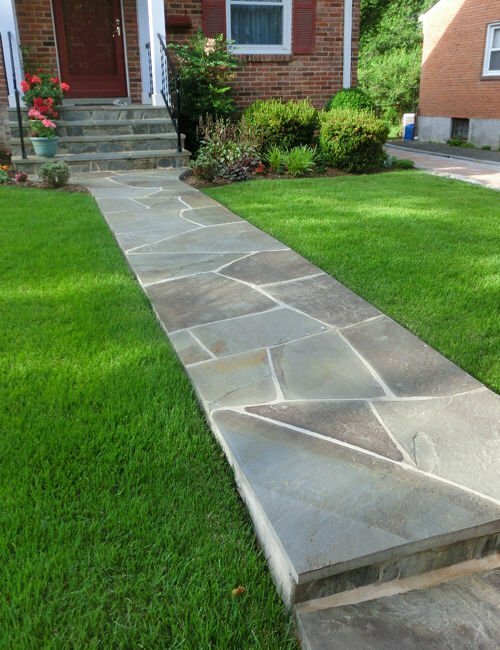 We can build a flagstone walkway, a paver walkway, a gravel walkway or even a grass walkway. A walkway defines your garden. It gives you obvious boundaries and routes while emphasizing focal points. A garden path allows much easier garden maintenance, and it boosts your sight lines. Most importantly, a garden walkway encourages you to enjoy your plants. Homeowners can get caught up in maintenance and the craft of gardening and forget why they planted the garden in the first place. You want to relax on a bench and talk over the day with your loved ones or meander through with guests. You want to savor your slice of the Great Outdoors in your own backyard. A well-constructed garden path gives you that opportunity. A walkway also serves as an important safety feature. When you’ve got a pool or it’s wet outside, you want a textured, paver walkway. 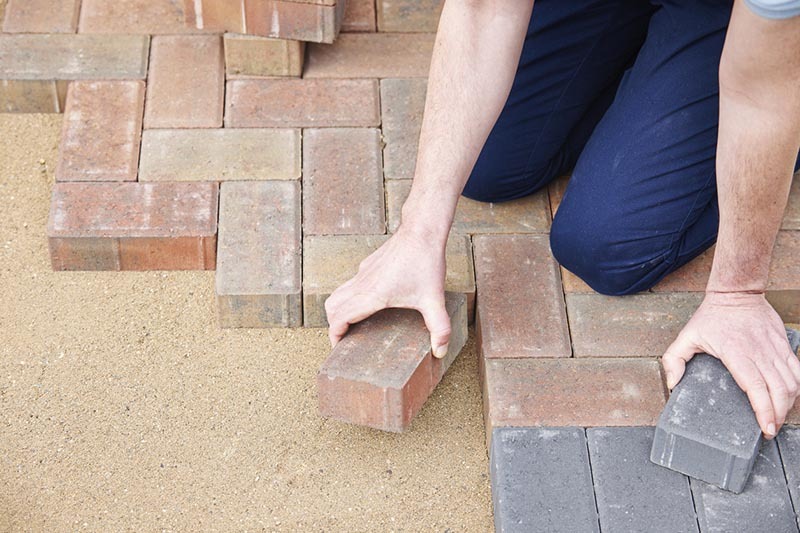 A paver walkway gives wet feet traction and reduces your risk of slips and falls. Plus, a walkway can expand your planting space. The sides of a walkway are ideal for adding accent plants, and you can even add “steppable” plants that creep between your stones and tolerate foot traffic. A stone wall is a quintessential masonry project. A stone wall can add a rustic touch to your property while serving important roles, including erosion control and boundary definition. 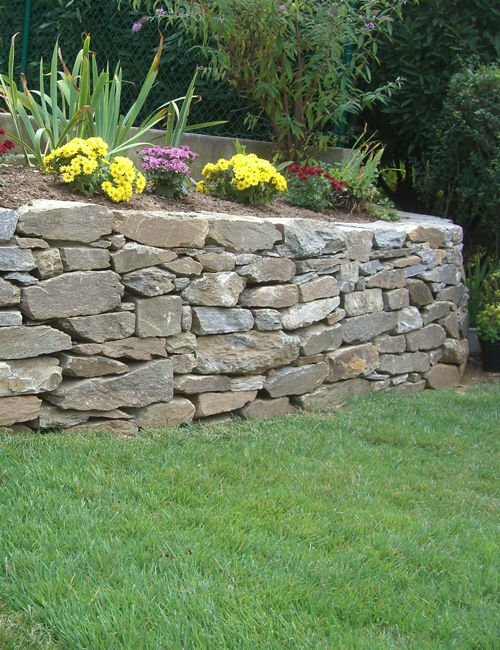 Any yard with a steep slope could benefit from a stone retaining wall. Slopes lead to erosion, which can ruin the curb appeal of your front yard or render your back yard unusable. Erosion can also create drainage issues that can cost you big. A stone retaining wall will hold back your soil and will last a lifetime without much maintenance. 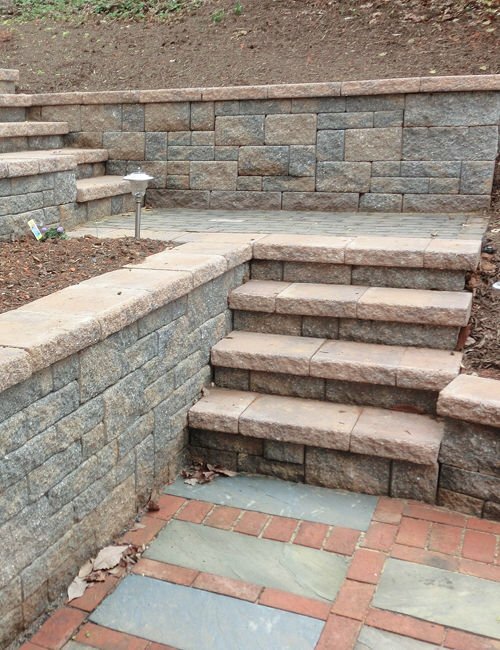 A stone retaining wall gives you the perfect opportunity to add features to your yard. Stone walls can serve as planting sites, provide obvious demarcation lines for a patio or give foundations for extra seating. If you need a retaining wall anyway, it’s simple to add features that make it an elegant part of your landscaping. A stone wall makes a bold statement. It defines your property line but keeps a natural look that blends with your landscaping. So natural, in fact, that stone is a great way to hem in your gardens. Your stone wall will last decades, probably even your whole life. Stone walls can withstand heavy soil loads, punishing weather, repeated whacks with lawnmowers and kids constant climbing over them. There are stone walls in Europe and Asia built centuries ago that remain structurally sound. Driveways are the first entranceway most visitors to your property see. 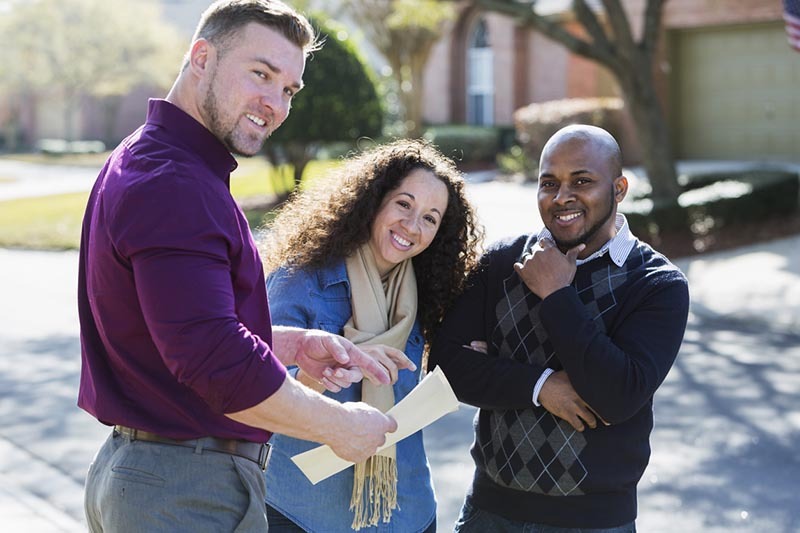 Your driveway cuts a wide swath through your property and plays a large role in how your home looks from the street. You want it to match your other landscaping while remaining sturdy enough to support your cars for decades. At Johnson’s, we typically recommend paver driveways. Pavers give you much, much more flexibility in terms of look and style. You can synchronize the look of your driveway with your home, steps, gardens, and landscaping. 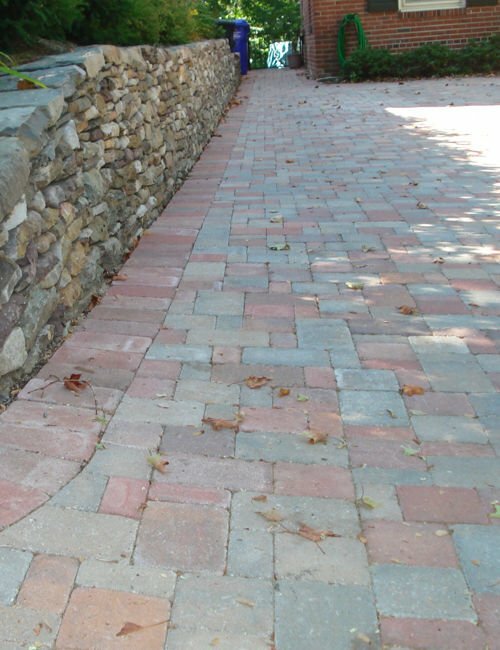 Paver driveways are easier to maintain than concrete driveways. While concrete driveways may crack and require extensive work, pavers hold together much better. And if a paver does crack, it’s easy to replace that single paver rather than the whole driveway. We also build steps to fit any need. Stairs are a complex project that homeowners can’t tackle on their own. Landing areas have to be level with one another, steps have a very small window of acceptable heights, and stairs can’t slope too much or too little. Our masons have built hundreds of stairs and know well the math that needs to be done and the precautions they have to take to ensure that your steps are safe and up to code.